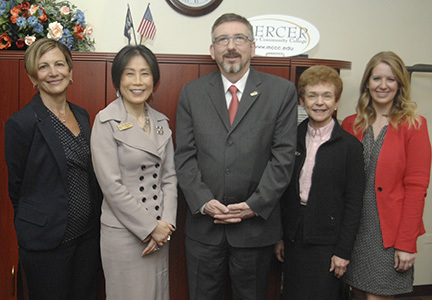 WEST WINDSOR – Mercer County Community College (MCCC) graduates will now have the flexibility to transfer to Rowan University in practically any field of study under a new agreement signed by the two institutions April 28. The agreement includes Rowan University’s highly-competitive programs in Business and Engineering, programs that are growing in popularity among Mercer students. Dr. Luci Nurkowski, Associate Director of Admissions at Rowan University; MCCC President Dr. Jianping Wang; Dr. Jeff Hand, Vice President for Strategic Enrollment Management at Rowan; Laurene Jones, MCCC's Director of Transfer Services; and Jennifer Cook, MCCC Transfer Counselor, following the signing of a new guaranteed admission agreement between MCCC and Rowan. MCCC President Dr. Jianping Wang said the agreement was an important step to make a four-year college degree a realistic goal for all students. Students who graduate from MCCC in one of 14 associate degree programs will be guaranteed admission to Rowan in a parallel major, provided that they meet the minimum GPA and pre-requisite requirements outlined in the agreement. Most majors require students to graduate with a minimum GPA of 2.0, with higher requirements for Business and Engineering programs. Students must sign up for this agreement within their first 30 credits at MCCC. MCCC currently has guaranteed admission programs with seven other schools, including Rutgers, The College of New Jersey, Rider University, and Fairleigh Dickinson University.